يوفر فندق Waterways Luxury Apartments ظروف إقامة راقية وهو خيار رائج للسياح ولرجال الأعمال أيضاً. يقع في منطقة تسوق, شواطئ, الحياة الليلية من المدينة. يحظى هذا الفندق ذو 4 نجمات بمكان ممتاز يسمح بالوصول إلى المعالم السياحية الأكبر في المدينة، فهو يبعد مسافة عن صخب المدينة. يقع هذا الفندق الحديث على مسافة قريبة من المعالم السياحية الشهيرة. استمتع بالخدمات الراقية والضيافة التي لا مثيل لها بهذا الفندق في هذه المدينة رائعة الجمال. يمكن للنزلاء الاستمتاع بالميزات التالية: خدمة سيارات الأجرة, مطبخ, تسجيل وصول/خروج سريع, تخزين الأمتعة, صف السيارات أثناء إقامتهم في هذا المكان الرائع. يمكن للنزلاء الاختيار من ضمن مجموعة من الغرف المصممة بعناية لتعكس جواً من الراحة، والتي يتجاوز عددها 1. يمكنك طلب اللائحة الكاملة للخدمات في الفندق ومن بينها حمام سباحة خارجي, حديقة, رياضات مائية (غير آلية). إن Waterways Luxury Apartments هو خيارك لخدمة الفنادق الراقية في المدينة. يجب دفع مبلغ تأمين بقيمة AUD 300 عند تسجيل الوصول لتغطية أي تكاليف أو أضرار قد تحدث أثناء فترة الإقامة وسيتم إعادته عند المغادرة. تتوفر خدمة الواي فاي/الإنترنت على مدار 24 ساعة بحد أقصى 500 ميجابايت في اليوم. تطبق رسوم إضافية بنسبة 1.65% عند استخدام بطاقة الائتمان. يُرجى الاتصال بالعقار لمزيد من التفاصيل. لا يسمح العقار بحجوزات حفلات نهاية السنة الدراسية. ليس لدى العقار سياسات أو إجراءات أو موارد لتلبية الاحتياجات الفريدة المطلوبة لحفلات تخرج المدارس خلال فترة الاحتفالات السنوية. لهذا السبب، نحتفظ بالحق في رفض الحجوزات من خريجي المدراس و/أو الجامعات طوال فترة الاحتفالات المدرسية. يجب أن يكون النزلاء الذين تقل أعمارهم عن 21 عام والذين يقيمون خلال فترة انتهاء المدارس أن يكونوا مقيمين مع الوصي قانوني أو الوالدين في نفس الغرفة خلال المدة كلها. يحتفظ العقار بالحق في رفض الحجوزات إذا لم يتمكن الوصي أو الوالد الذي يتجاوز عمره 21 عاما من تقديم بطاقة هوية تحمل صورة حالية أو إثبات الوصاية عند تسجيل الوصول. Very spacious. Well-equipped unit. 10 min walk to the beach. Beautiful location. Only grouse was the advert says unlimited wifi but we had a maximum of 500 MB per day. We're a family with 4 kids and stayed here for 5 nights in a 3 bedroom apartment. The staff were great, the place was clean and tidy and the gardens were immaculate and it was close to all the shops and other facilities. Highly recommended! Hello Ned, Thank you for the lovely review. The apartments are large which is great for families, also being close to shops etc is a bonus. We are very proud of our gardens and our secure building, as we like to call ourselves "Oasis in the heart of Surfers' I will also pass onto the staff and HK your comments. Hope to see you and your family again one day. 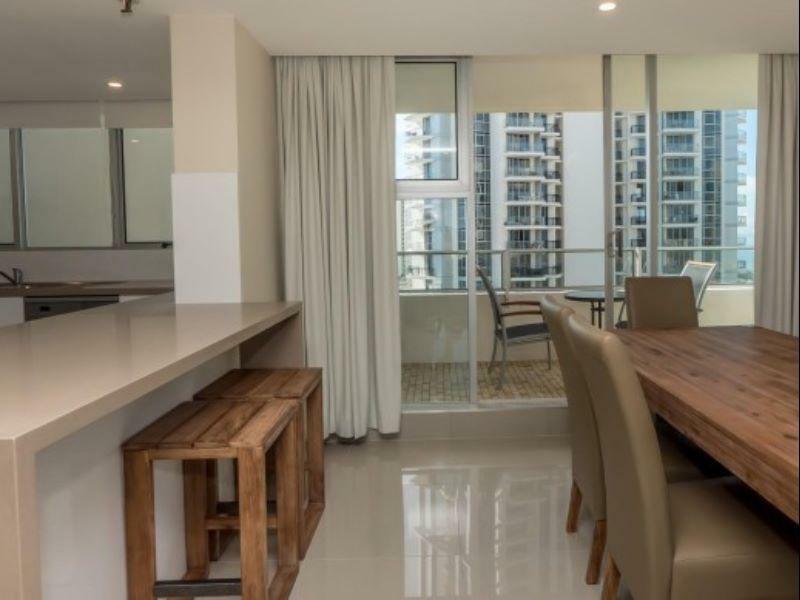 The 3 bedroom apartment was perfect for our futsal team that was attending the Pan Pacific Masters games on the Gold Coast. 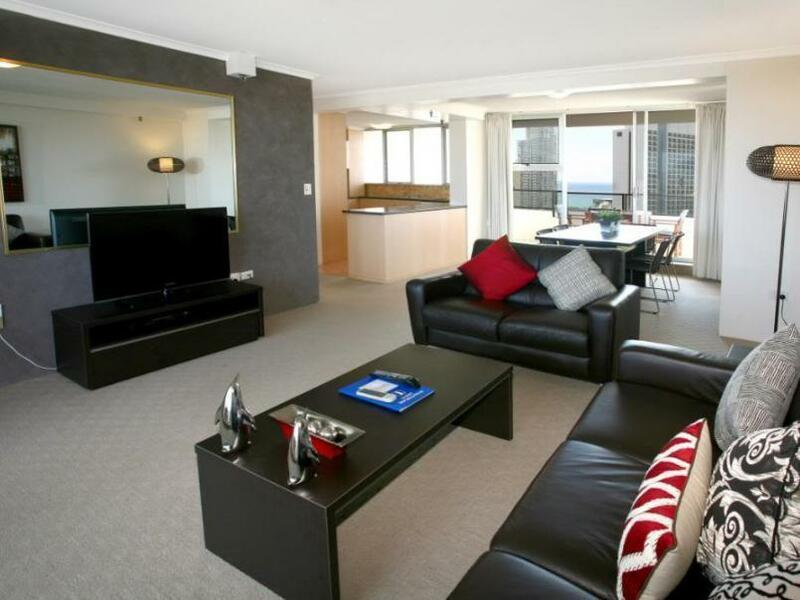 It was very spacious with a large balcony and sea views located walking distance to everything in Surfers Paradise. The facilities were great. We particularly loved the pool for relaxing with a beer after our matches. Deb and George who manage the building were very friendly and accommodating. We absolutely loved the Apartment ALL the comforts of home in a highly secure beautifully presented building and grounds. Firstly Waterways Luxury Apartments are NOT serviced Apartments. You are renting an Apartment for your stay. You are responsible for making your bed's (or dont) , hanging your towels ( or dont) and feeding yourself. George and Deb manage the building and reception and are not there to wait on YOU. we loved the privacy, convenience, security, self catering, Apartment we rented for the week. Its a reidential apartment complex with privately owned luxury apartments for short term rental. My view is if you believe George has been rude to you, how rude and expectant have you been to George. We found him to be polite, personable, respectful and an astute business manager. I can guarantee we'll be back. Thank you for a wonderful secure central AMAZING slice of wonderful. oh and the grounds and gardens are SPECTACULAR truly a credit . + good staff, valueable, near shopping centre, quiet place, river view and full kitchenette - They upgraded my room from 2 bedrooms to 3 bedrooms but there were alive bed bug nests in room 11 level 4. Make us terrified and good luck that it just climbed my friend neck. Hello, thank you for your kind review about the staff. It is great we are so central to everything. Also thank you for bringing to our attention regarding the bed bug, we got them just in time as they were just about to hatch. All gone now as we attended to this straight away, we also got all new bedding just to be sure. We have never had them before in the building and was quiet a shock to us. Amazing views from our balcony. Lovely facilities down by the river. Very friendly staff. We really enjoyed our stay here. Thank you for your lovely review. Agree our balconies have great views, especially of the river where sometimes you can see dolphins swimming up the river chasing fish. You were all a pleasure to have and hope to see you visit again soon. Great Location! 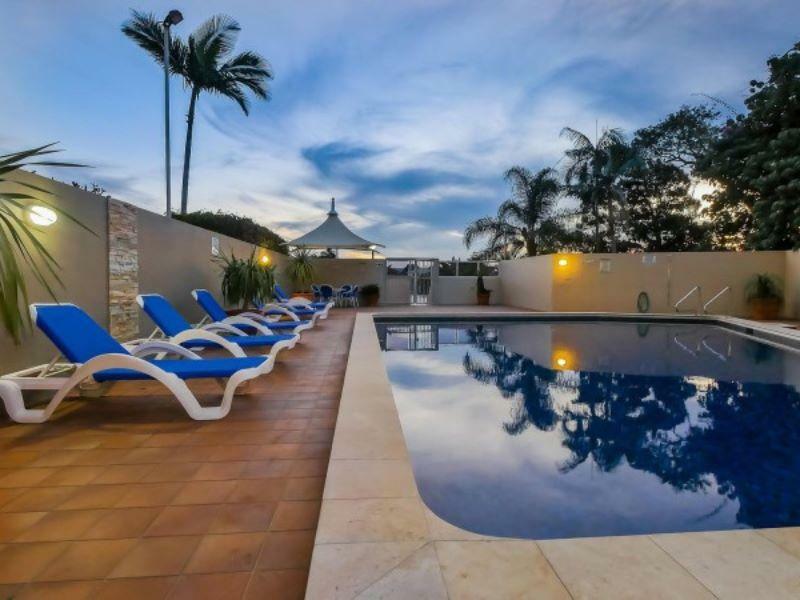 Spacious rooms, clean, Nerang River is in the back yard, will definitely stay here again! Thank you for the great review, agree we are in a great location and being on the river is great for fishing, not swimming. Hope to see you all agin one day. Everything near and easy to access-bus stop, goceries shop,beach and main tourist attraction. The apartment clean,full equipment with all i need.very recommended. Great location on the bank of the river & walking distance to everything in Surfers. 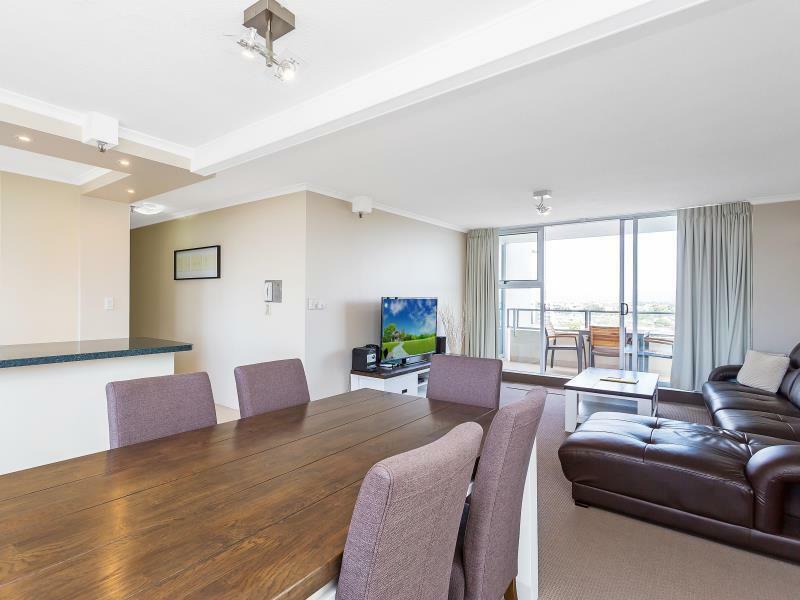 So close to Cavill Ave, shopping, restaurants, river & the beach. Stayed in 2 bedroom executive apartment & 3 bedroom apartment, balconies right round, very spacious & clean, no complaints at all! Beautiful gardens, friendly staff. Can't wait to stay again! Place was huge. Tight security. Somewhat clean. The Only issue was the WiFi! Its capped at 500mb per day. But we Only got WiFi The first day. No WiFi for the rest of Our stay Which was 6 nights! Thank you for your review, agree our units are large, great for families. As our internet comes from an outside source, if you had come to reception to advise us we could have found if there was a issue immediately and restored your internet. nice stay there. very central location, easy to get food and only few minutes walk to the beach. got a nice river view from balcony. the apartment is very sizeable and I would say very clean. love it and would start again. Beautifully renovated large apartments, wonderful location close to everything. Lovely & helpful staff. Recommended. Pros: location was fantastic, views were great, privacy also very good, free parking, all needed amenities to live there for 7 days. Cons: dryer didn't work, recliner couch didnt work, second bedroom light didnt work, hate to say but i found the male receptionist rather rude upon arival and when telling him what wasnt working in our apartment. Bed was two singles pushed together and very uncomfortable. Overall the stay was not that bad. We travel in a group of 7 including 2 child, thus apartment of whole unit with separate bedrooms suits our needs. Waterways location is pretty convenient although not the nearest to Surfers Paradise (walking distance 10 mins). It comes with full kitchen and laundry facilities. The only minus point is the unstable supply of hot water during shower as it keeps switching to cold water every now and then. Overall, was satisfy with the apartment. Great.bus station to all place is near.halal food for muslim is every where and all shops is walking distance. The apartment is adequately equipped especially the laundry and kitchen. If you are staying for one week like for our case all these will come in handy. Its closeness to the Coles supermarket, eateries, souvenir shops and the beach are all the plus points. The views outside the balcony are fantastic especially during the sunset.